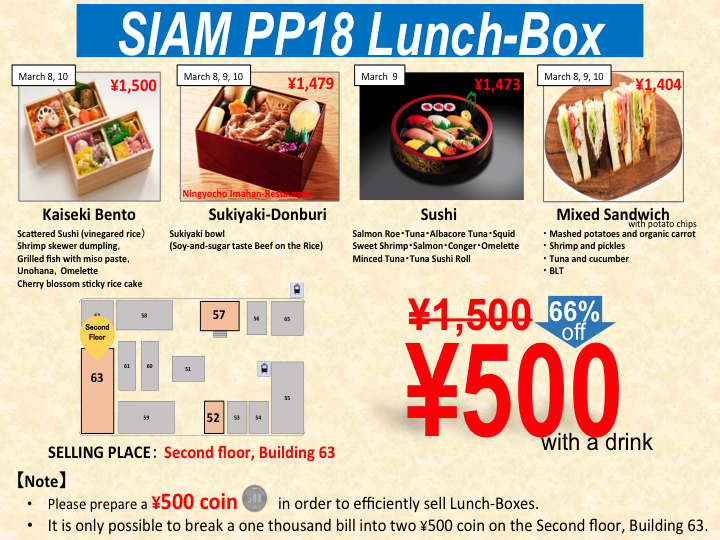 The special lunch boxes including traditional Japanese food are available ! The following lunch boxes will be sold on the 2nd floor at Building No.63 during the lunch time of the conference, since there are not enough time to go out. 2nd floor at Building No.63. * Please prepare a 500 JPY coin in advance. * Only a 1000 JPY banknote is acceptable to be changed into two 500 JPY coins on the place. * The lunch boxes are in limited supply.